Being an excellent source of nutrition, Rajma or Red kidney beans, from the legume family is a friend to all health conscious people. There are many types of kidney beans available. 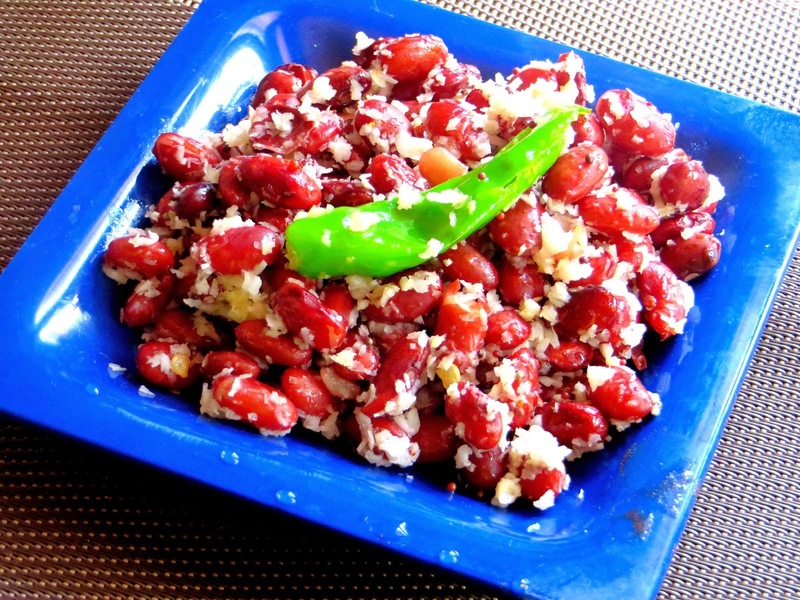 In this rajma sundal recipe, I have used a type of beans that is small and dark red. I have added generous amount of ginger to take care of the gas part ;-) Ginger also adds taste and nutrition to the sundal. Here's the recipe. Soak rajma beans over night in water. Next day, drain water and pressure cook rajma beans for 4 to 5 whistles with just enough water and a tablespoon of salt. Drain excess wate and keep the beans aside. Dry grind coconut and ginger together until its finely minced. Keep it aside. Heat oil in a kadai, preferably non stick. Temper the mustard seeds and add the green chillie and cooked rajma beans. Simmer heat and add Asafoetida powder and the ground coconut ginger. Sprinkle salt as the beans are already cooked in salted water. Stir well and turn off heat. Healthy rajma beans sundal is ready to serve.